Our planet is rich by interesting geographical events. You know about countries enclaves and exclaves and a lot of them are separated of other country by wall or river or towers. But town Baarle is a very unique place for sure: it is the Belgian enclave inside the Netherlands, in 5 km of the border, and by-turn there are the Dutch enclaves inside the Belgium ones. The Dutch-Belgian border here has a rather sophisticated form. It doesn’t follow rivers or other natural barriers. No. The borders can pass obliquely of the streets, make sharp turns right on the roads, sometimes they divide houses in two parts. Such a difficult border is a result of permanent lands trades and showdowns between Flemish feudal lords from different families in 1200–1650 years. After the Westphalia peace treaty in 1648 the lands here were divided between two Flemish states: the independent Netherlands and Belgium colonized by Spain. After the revolution in 1830 and new Belgium founding the border was demarked. 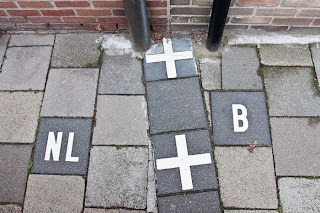 Baarle-Hertog is included in Belgian commune Antwerp, Baarle-Nassau is included in Dutch province North Brabant. 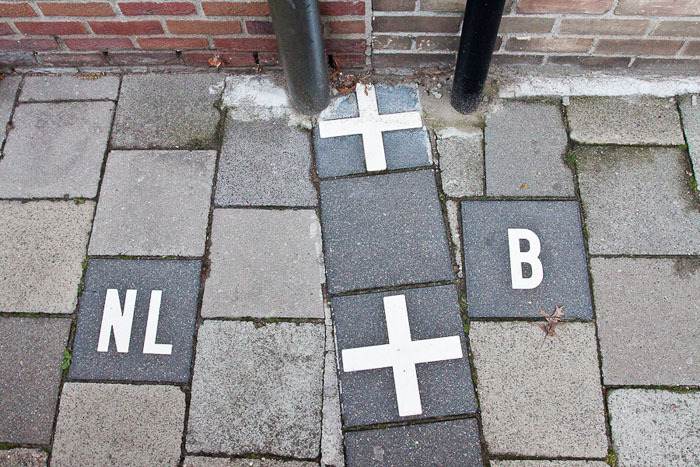 There are 22 Belgium enclaves and seven Dutch spots are situated inside them like Russian dolls. To know exactly what enclave is here they have letter and number markings. For example the enclave H12 has a territory of 260 square meters. So small! 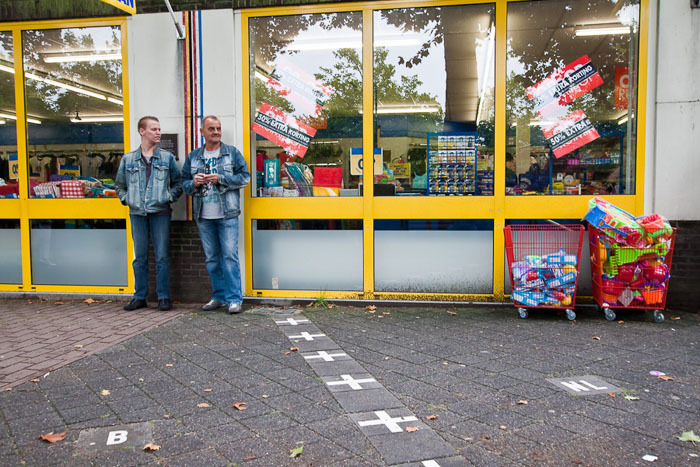 Special crosses on the ground are used to mark the border and these marks differ from the road marking. 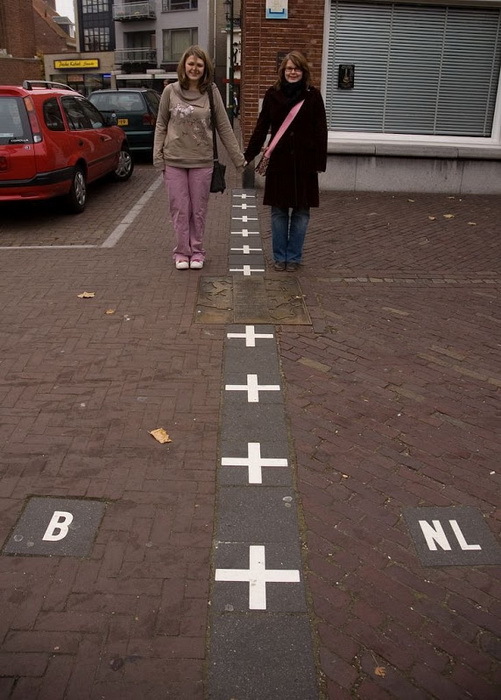 The whole Baarle centre is covered by crosses and tourists like to make pictures standing with one foot in Belgium and other one in Netherlands. Tthere are two ways to understand where you are in the town periphery: GPS and Google maps or a label near the front door. As a rule the state border goes along the ground areas borders. But sometimes it can pass right through houses and then kitchen will be in one country and bathroom will be in the other one. To escape difficulties it was decided to define state belonging of houses and citizenship of their people by where the front door is situated. All houses have labels with the national flags’ pictures: black-yellow-red for Belgium and red-white-blue for the Netherlands. This strange town has everything for two: two administrations, two cathedrals, two post offices, two garbage gathering companies. And it’s not surprising that dustcarts and postmen go along the streets twice in a day. There are three Belgian and three Dutch cellular networks, but as exception citizens can call each other by local prices not international. And only one tourist office intended for Dutch speakers. The police is situated in the Netherlands but also the Belgian people work there. In other respects Baarle is completely usual Flemish village. Certainly this amusing geographical location attracts here a lot of tourists and national features often are useful for travelers. For example, the Dutch restaurants are closed earlier than the Belgian ones and people just take another seat… and continue their party abroad. Taxi drivers can pass along one street often by different prices. Also the Belgian shops don’t work on Sundays and shopping lovers go abroad. By the way, now it is not so strange as several years ago, because some differences disappeared after the countries joined the European Union.